A precise, complete calcium & alkalinity control system in one simple, inexpensive package!! 2-Channel Dosing for Calcium/Alkalinity Control - The Nautilis II comes complete with a 2-channel tubing set, which allows you to dose both components of a 2-component system at identical rates simultaneously. The Nautilis II can dose as little as 3.6 mL/day per channel up to 1920 mL/day per channel. 1-Channel Set for Makeup – The one-channel high-volume tubing provides higher flow rates without putting excessive strain on the motor or gear assembly. 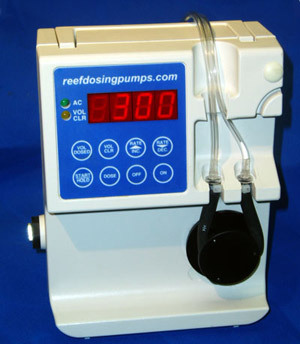 Rates are adjustable from 5 mL/hour to 850 mL/hour, and the one-channel set can be substituted for the 2-channel set when ordering the pump. Exceptionally quiet - quieter than your computer is right now. Self-Priming: also anti-siphoning when not running. Timer/Controller Compatible- Using the controller interface for timer or pH control enables the user to have the pump be controlled by a timer or pH controller. The pump remains on, but will run only when the controller is energized. Float Switch Compatible - Low voltage float switch accessory controls the pump's operation. The optional float switch uses only 5 Volt transistor-level voltage from pump to float switch, offering very long life of float electronics as well as assuring personal safety. 24/7 Operation - The Nautilis II is designed and built to medical standards for long-term, 24/7 operation. Important note: The Nautilis II is a previously used medical pump modified to provide optimum performance for the discerning reef hobbyist. It will be functionally perfect and is guaranteed for one full year. If you are not completely satisfied with the Nautilis II, you may return it within 30 days for a FULL refund, including shipping.